Much has been written on what is usually called "the Lord's Prayer" (which I prefer to term "the Family Prayer") and much upon the high priestly prayer of Christ in John 17, but very little upon the prayers of the apostles. Personally I know of no book devoted to the apostolic prayers, and except for a booklet on the two prayers of Ephesians 1 and 3 have been scarcely any separate exposition of them. It is not easy to explain this omission. One would think that the apostolic prayers are so filled with important doctrine and practical value for believers that they should have attracted the attention of those who write on devotional subjects. While many of us very much deprecate the efforts of those who would have us believe that the prayers of the Old Testament are obsolete and inappropriate for the saints of this Gospel age, it seems to me that even Dispensational teachers should recognize and appreciate. the peculiar suitability to Christians of the prayers recorded in the Epistles and the Book of Revelation. With the exception of the prayers of our Redeemer, only in the Apostolic prayers are praises and petitions specifically addressed to "the Father." Of all the prayers of Scripture, only these are offered in the name of the Mediator. Furthermore, in these apostolic prayers alone do we find the full breathings of the Spirit of adoption. How blessed it is to hear some elderly saint, who has long walked with God and enjoyed intimate communion with Him, pouring out his heart before the Lord in adoration and supplication. But how much more blessed would we have esteemed ourselves had we had the privilege of listening to the Godward praises and appeals of those who had companied with Christ during the days of His tabernacling among men! And if one of the apostles were still here upon earth, what a high privilege we would deem it to hear him engage in prayer! Such a high one, methinks, that most of us would be quite willing to go to considerable inconvenience and to travel a long distance in order to be thus favored. And if our desire were granted, how closely would we listen to his words, how diligently would we seek to treasure them up in our memories. Well, no such inconvenience, no such journey, is required. It has pleased the Holy Spirit to record a number of the apostolic prayers for our instruction and satisfaction. Do we evidence our appreciation of such a blessing? Have we ever made a list of them and meditated upon their import? In my preliminary task of surveying and tabulating the recorded prayers of the apostles, two things impressed me. The first observation came as a complete surprise, while the second was fully expected. That which is apt to strike us as strange—to some of my readers it may be almost startling—is this: the Book of Acts, which supplies most of the information we possess concerning the apostles, has not a single prayer of theirs in its twenty-eight chapters. Yet a little reflection should show us that this omission is in full accord with the special character of the book; for Acts is much more historical than devotional, consisting far more of a chronicle of what the Spirit wrought through the apostles than in them. The public deeds of Christ's ambassadors are there made prominent, rather than their private exercises. They are certainly shown to be men of prayer, as is seen by their own words: "But we will give ourselves continually to prayer, and to the ministry of the word" (Acts 6:4). Again and again we behold them engaged in this holy exercise (Acts 9:40; 10:9; 20:36; 21:5; 28:8), yet we are not told what they said. The closest Luke comes to recording words clearly attributable to apostles is in Acts 8:14,15, but even there he merely gives us the quintessence of that for which Peter and John prayed. I regard the prayer of Acts 1:24 as that of the 120 disciples. The great, effectual prayer recorded in Acts 4:24-30 is not that of Peter and John, but that of the whole company (v. 23) who had assembled to hear their report. The second feature that impressed me while contemplating the subject that is about to engage us, was that the great majority of the recorded prayers of the apostles issued from the heart of Paul. And this, as we have said, was really to be expected. If one should ask why this is so, several reasons might be given in reply. First, Paul was, preeminently, the apostle to the Gentiles. Peter, James, and John ministered principally to Jewish believers (Galatians 2:9), who, even in their unconverted days, had been accustomed to bow the knee before the Lord. But the Gentiles had come out of heathenism, and it was fitting that their spiritual father should also be their devotional exemplar. Furthermore, Paul wrote twice as many God-breathed epistles as all the other apostles added together, and he gave expression to eight times as many prayers in his Epistles as the rest did in all of theirs. But chiefly, we call to mind the first thing our Lord said of Paul after his conversion: "for, behold, he prays" (Acts 9:11, ital. mine). The Lord Christ was, as it were, striking the keynote of Paul's subsequent life, for he was to be eminently distinguished as a man of prayer. It is not that the other apostles were devoid of this spirit. For God does not employ prayerless ministers, since He has no dumb children. "Crying day and night unto him" is given by Christ as one of the distinguishing marks of God's elect (Luke 18:7, brackets mine). Yet certain of His servants and some of His saints are permitted to enjoy closer and more constant fellowship with the Lord than others, and such was obviously the case (with the exception of John) with the man who on one occasion was even caught up into Paradise (2 Corinthians 12:1-5). An extraordinary measure of "the spirit of grace and of supplications" (Zechariah 12:10) was given him, so that he appears to have been anointed with that spirit of prayer above even his fellow apostles. Such was the fervor of his love for Christ and the members of His mystical Body, such was his intense solicitude for their spiritual well-being and growth, that there continually gushed from his soul a flow of prayer to God for them and of thanksgiving on their behalf. Before proceeding further it should be pointed out that in this series of studies I do not propose to confine myself to the petitionary prayers of the apostles, but rather to take in a wider range. In Scripture prayer includes much more than merely making known our requests to God. We need to be reminded of this. Moreover, we believers need to be instructed in all aspects of prayer in an age characterized by superficiality and ignorance of God-revealed religion. A key Scripture that presents to us the privilege of spreading our needs before the Lord emphasizes this very thing: "Be careful for nothing; but in every thing by prayer and supplication with thanksgiving let your requests be made known unto God" (Philippians 4:6, ital. mine). Unless we express gratitude for mercies already received and give thanks to our Father for His granting us the continued favor of petitioning Him, how can we expect to obtain His ear and thus to receive answers of peace? Yet prayer, in its highest and fullest sense, rises above thanksgiving for gifts given: the heart is drawn out in contemplating the Giver Himself, so that the soul is prostrated before Him in worship and adoration. Though we ought not to digress from our immediate theme and enter into the subject of prayer in general, yet it should be pointed out that there is still another aspect that ought to take precedence over thanksgiving and petition, namely self-abhorrence and confession of our own unworthiness and sinfulness. The soul must solemnly remind itself of Who it is that is to be approached, even the Most High, before whom the very seraphim veil their faces (Isaiah 6:2). Though Divine grace has made the Christian a son, nevertheless he is still a creature, and as such at an infinite and inconceivable distance below the Creator. It is only fitting that he should deeply feel this distance between himself and his Creator and acknowledge it by taking his place in the dust before God. Moreover, we need to remember what we are by nature: not merely creatures, but sinful creatures. Thus there needs to be both a sense and an owning of this as we bow before the Holy One. Only in this way can we, with any meaning and reality, plead the mediation and merits of Christ as the ground of our approach. Thus, broadly speaking, prayer includes confession of sin, petitions for the supply of our needs, and the homage of our hearts to the Giver Himself. Or, we may say that prayer's principal branches are humiliation, supplication, and adoration. Hence we hope to embrace within the scope of this series not only passages like Ephesians 1:16-19 and 3:14-21, but also single verses such as 2 Corinthians 1:3 and Ephesians 1:3. That the clause "blessed be God" is itself a form of prayer is clear from Psalm 100:4: "Enter into his gates with thanksgiving, and into his courts with praise: be thankful unto him, and bless his name." Other references might be given, but let this suffice. The incense that was offered in the tabernacle and temple consisted of various spices compounded together (Exod. 30:34, 35), and it was the blending of one with another that made the perfume so fragrant and refreshing. The incense was a type of the intercession of our great High Priest (Rev. 8:3, 4) and of the prayers of saints (Malachi 1:11). In like manner there should be a proportioned mingling of humiliation, supplication, and adoration in our approaches to the throne of grace, not one to the exclusion of the others, but a blending of all of them together. The fact that so many prayers are found in the New Testament Epistles calls attention to an important aspect of ministerial duty. The preacher's obligations are not fully discharged when he leaves the pulpit, for he needs to water the seed which he has sown. For the sake of young preachers, allow me to enlarge a little upon this point. It has already been seen that the apostles devoted themselves "continually to prayer, and to the ministry of the word" (Acts 6:4), and thereby they have left an excellent example to be observed by all who follow them in the sacred vocation. Observe the apostolic order; yet do not merely observe it, but heed and practice it. The most laboriously and carefully-prepared sermon is likely to fall unctionless upon the hearers unless it has been born out of travail of soul before God. Unless the sermon be the product of earnest prayer we must not expect it to awaken the spirit of prayer in those who hear it. As has been pointed out, Paul mingled supplications with his instructions. It is our privilege and duty to retire to the secret place after we leave the pulpit, there begging God to write His Word on the hearts of those who have listened to us, to prevent the enemy from snatching away the seed, and to so bless our efforts that they may bear fruit to His eternal praise. Luther was accustomed to say, "There are three things that go to the making of a successful preacher: supplication, meditation, and tribulation." I know not what elaboration the great Reformer made. But I suppose he meant this: that prayer is necessary to bring the preacher into a suitable frame to handle Divine things and to endue him with Divine power; that meditation on the Word is essential in order to supply him with material for his message; and that tribulation is required as ballast for his vessel, for the minister of the Gospel needs trials to keep him humble, just as the Apostle Paul was given a thorn in the flesh that he might not be unduly exalted by the abundance of the revelations granted to him. Prayer is the appointed means for receiving spiritual communications for the instruction of our people. We must be much with God before we can be fitted to go forth and speak in His name. Paul, in concluding his Epistle to the Colossians, informs them of the faithful intercessions of Epaphras, one of their ministers, who was away from home visiting Paul. "Epaphras, who is one of you, a servant of Christ, salutes you, always laboring fervently for you in prayers, that you may stand perfect and complete in all the will of God. For I bear him record, that he has a great zeal for you . . ." (Colossians 4:12, 13a). Could such a commendation of you be made to your congregation? But let it not be thought that this marked emphasis of the Epistles indicates a duty for preachers only. Far from it. These Epistles are addressed to God's children at large, and everything in them is both needed for, and suited to, their Christian walk. Believers, too, should pray much not only for themselves but for all their brothers and sisters in Christ. We should pray deliberately according to these apostolic models, petitioning for the particular blessings they specify. I have long been convinced there is no better way—no more practical, valuable, and effective way—of expressing solicitude and affection for our fellow saints than by bearing them up before God by prayer in the arms of our faith and love. By studying these prayers in the Epistles and pondering them clause by clause, we may learn more clearly what blessings we should desire for ourselves and for others, that is, the spiritual gifts and graces for which we have great need to be solicitous. The fact that these prayers, inspired by the Holy Spirit, have been placed on permanent record in the Sacred Volume declares that the particular favors sought herein are those which God has given us warrant to seek and to obtain from Himself (Romans 8:26, 27; 1 John 5:14, 15). We will conclude these preliminary and general observations by calling attention to a few of the more definite features of the apostolic prayers. Observe then, to Whom these prayers are addressed. While there is no wooden uniformity of expression but rather appropriate variety in this matter, yet the most frequent manner in which the Deity is addressed is as Father: "the Father of mercies" (2 Corinthians 1:3); "the God and Father of our Lord Jesus Christ" (Ephesians 1:3; 1 Peter 1:3); "the Father of glory" (Ephesians 1:17); "the Father of our Lord Jesus Christ" (Ephesians 3:14). In this language we see clear evidence of how the holy apostles took heed to the injunction of their Master. For when they made request of Him, saying, "Lord, teach us to pray," He responded thus: "When you pray, say, Our Father which are in Heaven" (Luke 11:1, 2, ital. mine). This He also taught them by means of example in John 17:1, 5, 11,21, 24, and 25. Both Christ's instruction and example have been recorded for our learning. We are not unmindful of how many have unlawfully and lightly addressed God as "Father," yet their abuse does not warrant our neglecting to acknowledge this blessed relationship. Nothing is more calculated to warm the heart and give liberty of utterance than a realization that we are approaching our Father. If we have received, of a truth, "the Spirit of adoption" (Romans 8:15), let us not quench Him, but by His promptings cry, "Abba, Father." When you pray let your words be few, but your thoughts and affections many, and above all let them be profound. The less you speak the better you pray. . . . External and bodily prayer is that buzzing of the lips, that outside babble that is gone through without any attention, and which strikes the ears of men; but prayer in spirit and in truth is the inward desire, the motions, the sighs, which issue from the depths of the heart. The former is the prayer of hypocrites and of all who trust in themselves: the latter is the prayer of the children of God, who walk in His fear. Observe, too, their definiteness. Though exceedingly brief, yet their prayers are very explicit. There were no vague ramblings or mere generalizations, but specific requests for definite things. How much failure there is at this point. How many prayers have we heard that were so incoherent and aimless, so lacking in point and unity, that when the Amen was reached we could scarcely remember one thing for which thanks had been given or request had been made! Only a blurred impression remained on the mind, and a feeling that the supplicant had engaged more in a form of indirect preaching than direct praying. But examine any of the prayers of the apostles and it will be seen at a glance that theirs are like those of their Master's in Matthew 6:9-13 and John 17, made up of definitive adorations and sharply-defined petitions. There is neither moralizing nor uttering of pious platitudes, but a spreading before God of certain needs and a simple asking for the supply of them. Consider also the burden of them. In the recorded apostolic prayers there is no supplicating God for the supply of temporal needs and (with a single exception) no asking Him to interpose on their behalf in a providential way (though petitions for these things are legitimate when kept in proper proportion to spiritual concerns. Instead, the things asked for are wholly of a spiritual and gracious nature: that the Father may give unto us the spirit of understanding and revelation in the knowledge of Himself, the eyes of our understanding being enlightened so that we may know what is the hope of His calling, the riches of the glory of His inheritance in the saints, and the exceeding greatness of His power to usward who believe (Ephesians 1: 17-19); that He would grant us, according to the riches of His glory, to be strengthened with might by His Spirit in the inner man, that Christ may dwell in our hearts by faith, that we might know the love of Christ which passes knowledge, and be filled with all the fullness of God (Ephesians 3:16-19); that our love may abound more and more, that we might be sincere and without offense, and be filled with the fruits of righteousness (Philippians 1:9-il); that we might walk worthy of the Lord unto all pleasing (Colossians 1:10); that we might be sanctified wholly (1 Thessalonians 5:23). Note also the catholicity of them. Not that it is either wrong or unspiritual to pray for ourselves individually, any more than it is to supplicate for temporal and providential mercies; I mean, rather, to direct attention to where the apostles placed their emphasis. In one only do we find Paul praying for himself, and rarely for particular individuals (as is to be expected with prayers that are a part of the public record of Holy Scripture, though no doubt he prayed much for individuals in secret). His general custom was to pray for the whole household of faith. In this he adheres closely to the pattern prayer given us by Christ, which I like to think of as the Family Prayer. All its pronouns are in the plural number: "Our Father," "give us" (not only "me"), "forgive us," and so forth. Accordingly we find the Apostle Paul exhorting us to be making "supplication for all saints" (Ephesians 6:18, ital. mine), and in his prayers he sets us an example of this very thing. He pleaded with the Father that the Ephesian church might "be able to comprehend with all saints what is the breadth, and length, and depth, and height; And to know the love of Christ, which passes knowledge" (Ephesians 3:18, ital. mine). What a corrective for self-centeredness! If I am praying for "all saints," I include myself. Finally, let me point out a striking omission. 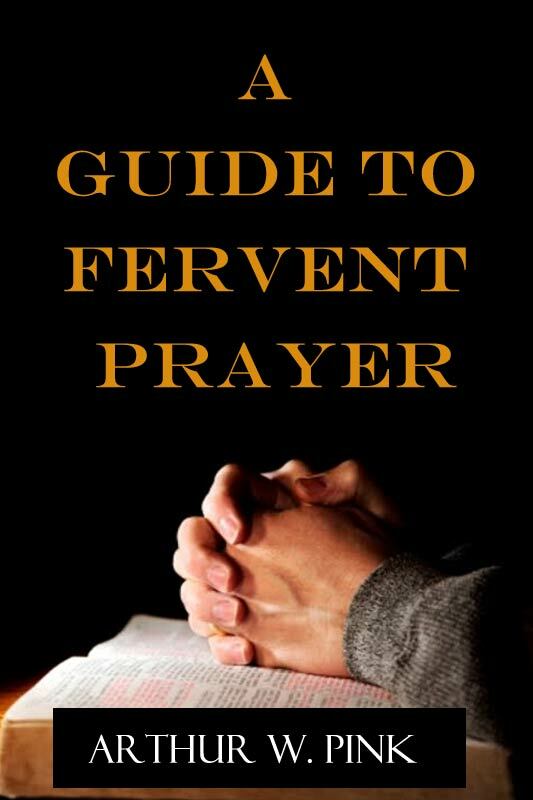 if all the apostolic prayers be read attentively, it will be found that in none of them is any place given to that which occupies such prominence in the prayers of Arminians. Not once do we find God asked to save the world in general or to pour out His Spirit on all flesh without exception. The apostles did not so much as pray for the conversion of an entire city in which a particular Christian church was located. In this they conformed again to the example set for them by Christ: "I pray not for the world," said He, "but for them which you have given me" (John 17:9). Should it be objected that the Lord Jesus was there praying only for His immediate apostles or disciples, the answer is that when He extended His prayer beyond them it was not for the world that He prayed, but only for His believing people until the end of time (see John 17:20, 21). It is true that Paul teaches "that supplications, prayers, intercessions, and giving of thanks, be made for all [classes of] men; for kings, and for all that are in authority" (1 Timothy 2:1, 2a, brackets mine)—in which duty many are woefully remiss—yet it is not for their salvation, but "that we may lead a quiet and peaceable life in all godliness and honesty" (v. 2b, ital. mine). There is much to be learned from the prayers of the apostles.